EURUSD trades flat after hitting high of 1.13616 yesterday and was trading with positive bias for past past 1-week. Markets eye Fed policy meeting for further direction. Fed is expected to be more dovish and investors gives more importance to Fed dot plot. It hits intraday low of 1.1355 and is currently trading around 1.13523. The yield spread between US and German bund has narrowed to 249 basis point from 259 basis point and for 2 year spread hits 11-month low is supporting Euro. 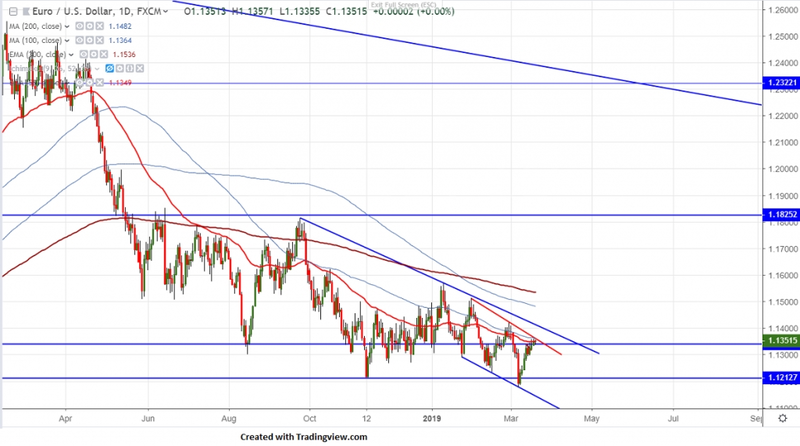 On the higher side near term major resistance is around 1.13625 (trend line resistance) and any violation above will take the pair to next level till 1.13805 (61.8% fib)/1.14225/1.1500. The near term support is around 1.13450 (55- day EMA) and any break below will drag the pair to next level till 1.12970/1.12600/1.12380. Any break below 1.12150 will drag the pair till 1.11760/1.1150. It is good to buy on dips around 1.13200 with SL around 1.12800 for the TP of 1.1425/1.1500.